A full-time Basketmaker with 23 years experience Nadine Anderson weaves in willow and rush, the latter she harvests in the Cambridgeshire Fens. 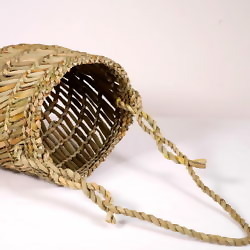 There are a core number of designs that are always in stock such as Rush Totes and Willow Pumpkin Log Baskets but she is constantly pushing the boundaries of her materials and developing new work, often for commissions. The traditional vernacular baskets of the 2oth Century have been an important area of research including Welney Eel Traps and Cambridgeshire Potato Cobs. She has made baskets for film production companies and two full size Rush Green Man costumes for The Lord Mayors Show in 2018. She is a Yeoman Basketmaker to the Worshipful Company of Basketmakers and is currently an active member of the Basketmakers' Association, organising their Spring and Autumn courses. She teaches both schools and adult basketry classes and participates in Cambridge Open Studios each July. Rush and willow basketry and teaching.